Welcome to this weeks Kids in the Kitchen. This week we made naan bread to go with our usual Saturday night curry. I used to buy naan bread until I found out how easy it was to make, and it tastes much better than the supermarket ones. And finally, on The Beesley Buzz blog the whole family got stuck in to making some fabulous Mario Cupcakes! Thank you all so much for joining in and sharing your cooking activities and recipes. Measure the flour into a large bowl and add the yoghurt and warm water. Leave the dough, covered with a clean tea towel for about an hour. Seperate the dough into balls, we usually make four, but you can make more or less depending on how big you want them to be. Take one ball at a time and pull and stretch into shape, usually a large teardrop, but they can be round or oval if you wish. Then it’s time for the adult to take over and grill each naan bread under a hot grill for a minute or two on each side, until just starting to brown. They may bubble up and rise under the grill, and it doesn’t matter if you get a couple of darker brown bits where they bubble. Finally, brush the naan breads with melted butter. Here are Boo and the Little Man making their naan bread. Do come and join us with your posts about your kids cooking or helping in the kitchen. I welcome old posts or new and the linky will be open until Monday next week. 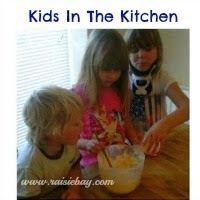 You can find more about Kids in the Kitchen here. I’d also be mighty grateful if you included my badge in your post so others can see it and come along and join in.